CHOLLEY Vitamin C Factor is a revitalizing product with high concentration of Pure Vitamin C for face and body. Vitamin C is of primary importance in production of collagen fibers to fortify the skin. It plays a similar role in biosynthesis of polysaccharides, which are the fundamental substances of the connective tissue. 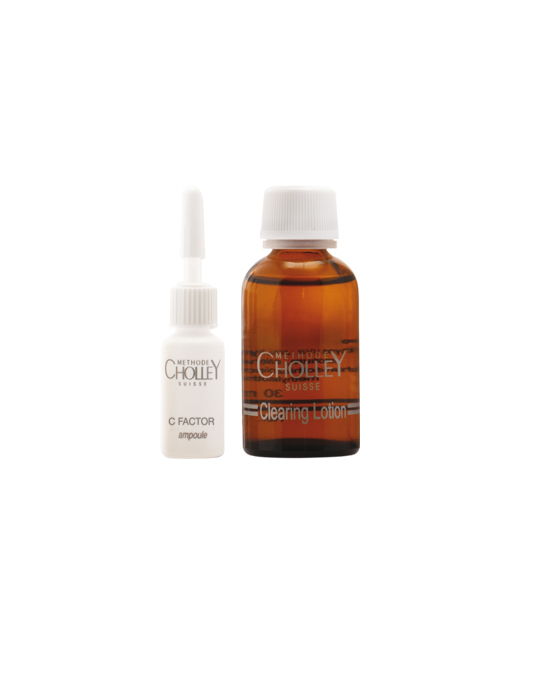 CHOLLEY Vitamin C Factor is very effective for reducing lines and wrinkles, lightening the skin, eliminating pigmentation irregularities & post acne stains, and reducing swelling caused by acne or couperose. CHOLLEY Vitamin C Factor can be used safely for as long as desired. After your routine cleansing with BIOREGENE or BIOCLEAN Lait and Lotion, apply 3-5 drops directly on the skin or mixed with your regular face/body cream or lotion, suitable for your skin. It is particularly beneficial after a peeling treatment.